This obscure German label deserves much wider currency and with Christiane Klonz they definitely have a winner soloist up their sleeve. 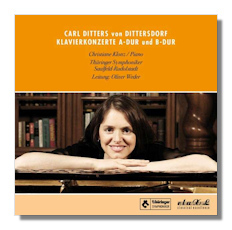 Her performances in the two Dittersdorf concertos reveal a soloist with quite nimble touches and a real feel for the music. She brings an innate spirituality to the slow movements and a well judged vitality to the outer and faster movements. Her performance of the Haydn sonata is also treasurable, very reminiscent of greats such as Brendel and Peter Katin whose complete survey of these works still remains hors conceurs. However I am keen to examine further recordings of this fine pianist from this label. The booklet notes are serviceable and the recording more than adequate with a slight sheen on the strings but it is judiciously balanced. Copyright © 2011, Gerald Fenech.